Who Are Those Two Dudes? 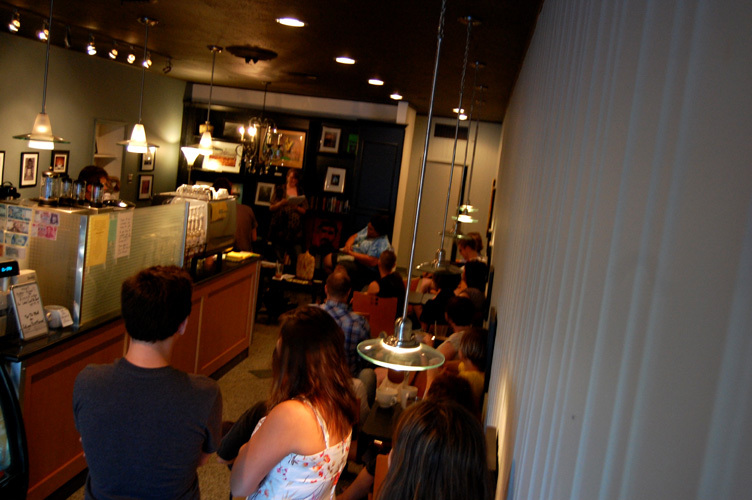 Around 40 people came out to the reading with Brett Elizabeth Jenkins last night, where I told them this wasn’t no finger-snapping event, that clapping and heckling were welcome and encouraged. There wasn’t much in the way of heckling. I printed off the lyrics to “Freebird” just in case, but didn’t end up having to use them. The award for best heckler of the night goes to the fruit fly that kept buzzing around my head for half my set. 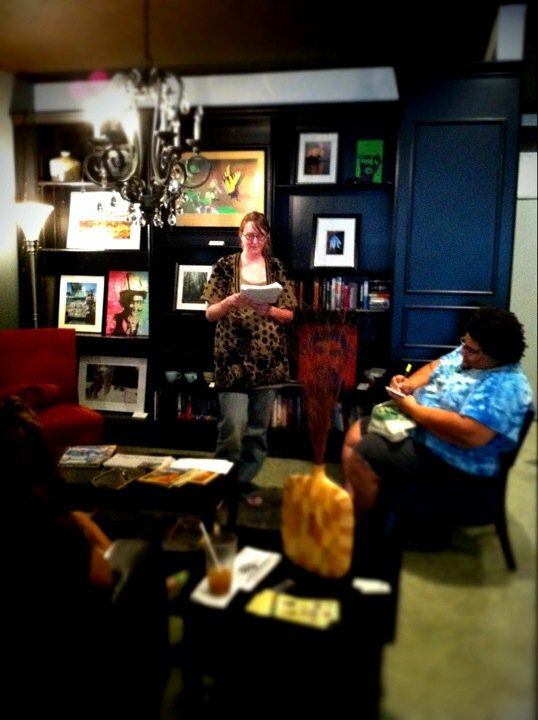 Brett read from a notebook full of material and had the crowd guffawing throughout her set, her poems negotiating that careful balance between humor and sorrow and insight. Afterwards, I manned the Vouched table and had a couple of great conversations with people about how they’d never seen books like these. I’m glad to report that I need to make a couple restocking orders before my next time out on Aug. 6th. 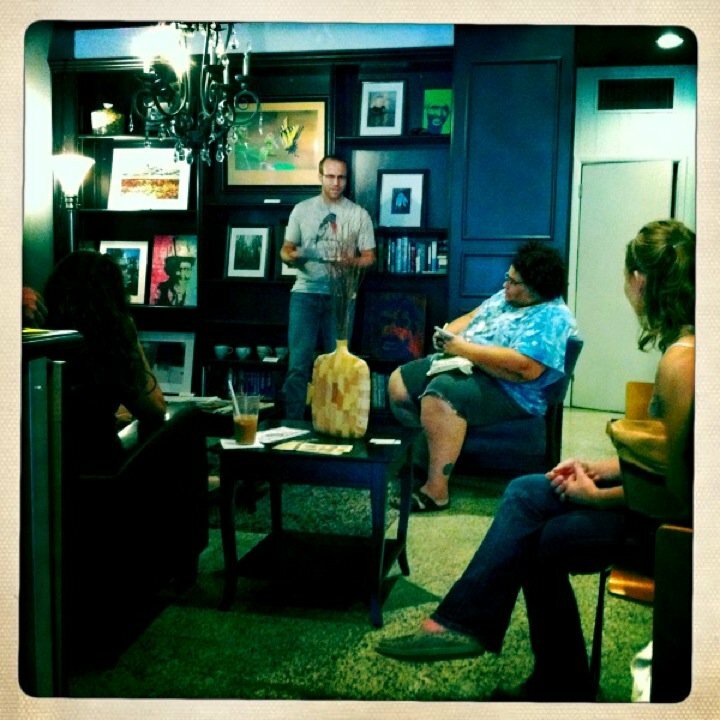 Much thanks to Calvin Fletcher Coffee Co. for providing a cozy space for the reading, for Brett Jenkins for the excuse to have the reading, Brandon for the photos, JL Kato for the promo and bringing friends, and everyone for coming out and getting stoked about poetry and good words for an evening.